The LuminAID PackLite lanterns are compact, solar-powered LED lights that fold flat when not in use, and inflate into a lightweight, portable light sources. Safe, sustainable and ultra-portable, both Packlite models are the perfect size to light up a tent or to keep around the house in a first aid kit. The PackLites recharge with a built-in, high-efficiency solar panel in just 7 hours of sunlight. The durable and weather-resistant TPU plastic material (100% PVC-free) inflates to diffuse the LED light and create a lantern. Attach them to your backpack to charge on the go, hang from a tent, or carry as a torch to light your path ahead! LuminAID is the brainchild of architectural design students Andrea Sreshta and Anna Stork. Shortly after the massive Haitian earthquake in 2010, the pair were tasked with designing a product that could assist post-earthquake relief efforts and the idea for a durable inflatable solar light that packs flat was born. Fifty handmade prototypes later, they felt they had come up with something revolutionary and immediately filed their first utility patent, and their second utility patent soon after. In 2011, the two cofounders graduated architectural school and launched a crowdfunding campaign on IndieGoGo to bring their invention to market. The campaign exceeded all expectations, raising 500% of their initial funding goal, selling to customers in more than 20 countries worldwide. After winning numerous innovation and clean energy program awards, the founders found themselves invited to pitch to ABC’s Shark Tank investors where they received offers from all five Sharks before closing a deal with their company’s first investor and Shark, Mark Cuban. LuminAID lighting products are designed to provide light under a wide variety of environmental conditions. They are currently available in three models: the PackLite 12, the PackLite 16 and the PackLite Spectra. Each model is essentially a solar-rechargeable LED light source and a blowup diffuser with a few unique design features that set them apart from each other. All electronic components are completely lead-free and RoHs compliant for safety. LuminAID products are also guaranteed against defects for one full year. Each lantern is powered by a solar-rechargeable lithium-polymer battery with a flat discharge rate and extended storage life of as much as 2 years between charges in temperatures between -4º F and 140º F (-20º C to 60º C). Fully charged, the battery should retain at least 80% of its capacity for the first two months. Lithium-polymer batteries are typically capable of handling as many as 300 – 400 charging cycles providing LuminAID products a long life, but that number can vary tremendously. The solar charging unit is a highly efficient monocrystalline panel with a ~19% efficiency allowing each of the LuminAID models to charge fully in 7-10 hours, even with moderate shade and cloud cover. On the front face of the panel, there is a convenient red LED light that indicates the strength of the charge that the solar panel is generating. The charging indicator turns green once the battery level reaches 95% so it is fine to keep charging the unit even after the light has turned green. Just clip the light to the outside of your pack with the integrated carabiner loop or retention strap and let it charge away. The inflatable diffusers are made from a rugged PVC-free polyurethane thermoplastic for its enhanced elasticity and exceptional abrasion and chemical -resistant properties. All seams are heat-welded for a durable leak-proof seal. The rechargeable light unit is sealed into its own pocket protecting it from dust, moisture and other environmental damage. The durable polyurethane body allow their lanterns to float when inflated, and operate while fully submersed to a depth of up to 1 meter giving it an IPX-7 rating. 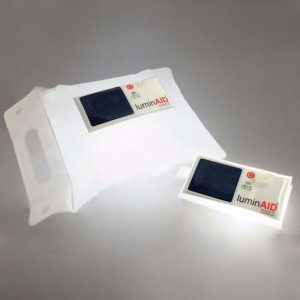 Fully inflated, the LuminAID PackLite 12 is an extremely versatile 4″ cubed lantern, and packs down to a slim 4″ x 4″ square approximately 1″ tall when it is fully deflated. The new twist-to-close design make the PackLite 12 easy to collapse and stow away in-a-hurry, and the adjustable retention strap seconds as a nifty handle or for hanging the lantern from just about anything. The entire unit weighs only 3.5 ounces and is certainly small enough to stow at least one away in a typical emergency or first aid kit. The PackLite 12 features four mode settings that provide as much as 32 hours of light from 12 extra-bright LEDs. The red power-button cycles through each of the four modes consisting of a HIGH setting capable of providing 45 lumens of light for as long as 6-hours, a MEDIUM setting that provides light as long as 8 hours, a LOW setting for as much as 12 hours of light, and a flashing BEACON setting for as much as 32 hours of light perfect for signaling for help. Fully inflated, the LuminAID PackLite 16 becomes a lantern that is 10″ tall, 7.5″ wide and 5″ deep, easily capable of lighting a 125 sq. ft room. Deflated, the PackLite 16 folds and flattens down into a compact package no larger than 5.5″ x 3″ x 3/4″, and weighs a little less than 3 ounces. It has a retention strap to keep the diffuser bag folded securely, with the inflation valve protected from damage. This PackLite 16 has a clear advantage over the other models due to its compact folded size and its light weight making it ultra-portable. 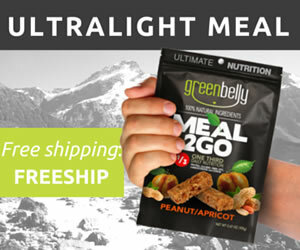 Perfect for dropping one in your pocket on your way out the door, stowed away in your glove compartment, center console or inside your emergency preparedness kit. It has a carry handle and two grommets molded right into the plastic flap so it is easy to grip, and even easier to tether securely when hanging the light. The PackLite 16 four mode settings that provide as much as 32 hours of light from two extra-bright LEDs. The red power-button cycles through each of the four modes consisting of a HIGH setting capable of providing 65 lumens of light for as long as 6-hours, a MEDIUM setting that provides 35 lumens of light as long as 10 hours, a LOW setting that provides 20 lumens of light as long as 30 hours, and a slow 20-lumen flashing BEACON that lasts as long as 32 hours, perfect for signaling help. The PackLite Spectra has the exact same form factor and features of the PackLite 12, with the exception of the lighting modes. What makes the PackLite Spectra unique are the 8 color modes including red, orange, yellow, green, blue, turquoise, purple and white, and a multi-color fade mode providing as much as 12 hours of light. The LuminAID PackLite Spectra can be found on Amazon. LuminAID lanterns were designed to be so easy to use that a kid could do it with only basic instruction. All you have to do is unbutton the retention strap, unfold to locate the inflation valve and blow until it is slightly firm, but not overly full. The inflation valves are very durable so they might seem a bit rigid which did make it a little troublesome getting the valve open enough to let air into the diffuser bag. When you are all done and want to put it away, simply open the inflation valve plug and pinch the valve to release the air. You can squeeze the air out as you fold it up, but don’t have to worry about getting every last bit out before you put it away. When deflated, the light from the lanterns is no longer diffused resulting in a focussed light beam that can be used more like a traditional flashlight which can be especially helpful if you need to find your way in the dark. If you happen find a hole in the polyurethane material, the diffuser bag can easily be repaired with a non-porous tape. Electrical tape or a heavy packing tape should work perfectly for this. However, an inflatable air mattress repair kit would be the best option for a permanent repair. 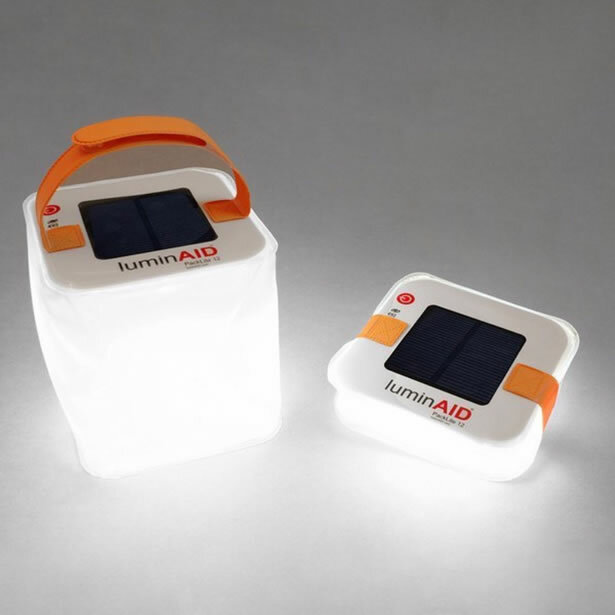 LuminAID lanterns have been used in more than 70 countries worldwide to date. Proudly, LuminAID has distributed tens of thousands of lights through their Give Light, Get Light program to natural disaster relief efforts including Hurricane Sandy, Hurricane Isaac, Typhoon Haiyan and the earthquakes in Haiti and Nepal, and to charitable projects in more than 50 countries, not to mention NGOs like Shelterbox and Doctors Without Borders. Aside from tossing the two PackLite units that I had for testing around for a while, watching them float around in water and holding them under water for a brief period of time, I only had two more tests that I could use to simulate real world use once the batteries were topped off. The first was to turn the light on high and demonstrate how long it would take to completely deplete the batteries. The second was to test how long it took to fully charge both units when placed in direct sunlight. As far as holding a charge over time, I will definitely have to revisit and amend the article once I’ve had them for a while longer. Once both units were completely charged which only took a few hours, I turned them both on high and started the clock ticking. The PackLite 12 was pumping out 45 lumen on HIGH from its 12 LEDs that lasted just over 5 hours and 50 minutes before it shut itself off. The PackLite 16 on the other hand was putting out 65 lumen on HIGH from its two extra-bright LEDs that lasted almost 6 hours and 40 minutes before shutting down. The following morning I began recharging both units to test how long it took to charge them. I noticed that the charging indicator shined brightly whether the panel was in direct sunlight or in a slightly shaded environment. Regardless, I decided to lean both units against a wall with both panels directly facing sun so they could charge as fast as possible. I adjusted the direction that the panels faced every few hours in an attempt to achieve the most efficient charge. Both received direct sunlight for just over 12.5 hours, but neither unit had reached a 95% charge. As a result, I decided to put them back out the following morning. Again, I placed them on the wall directly facing the sun. After another 3.5 hours, the PackLite 16 charging indicator finally turned green, which essentially meant that it had reached 95% charge so I left it charging for another 4 hours just to be sure that it was completely full. After all was said and done, it took nearly 20 hours to fully charge the PackLite 16 from a completely empty state. Not at all what I was expecting… But I do know that it is best not discharge lithium-ION and lithium-polymer batteries completely. The PackLite 12 does not have a green LED to show when it has reached at least 95% so I never really new when it had charged entirely. I figured it should charge about as fast as the PackLite 16 so I used it as a reference for how long it should take. 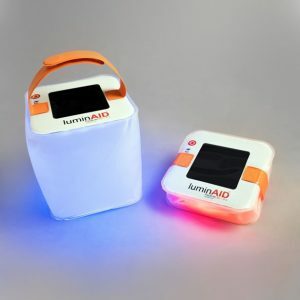 After spending some time playing around with these LuminAid lanterns, I’ve come to realize their value as inexpensive solar-powered light sources designed with emergency preparedness in mind. They are compact, rugged, lightweight, waterproof and very simple to operate. Best of all, there are no batteries to deal with, albeit both models did take longer than expected to recharge. The light generated is easily capable of lighting most rooms and can be seen from at least a few miles away, especially in the beacon mode which is ideal for drawing attention when you need it to. At a little less than $20 each, the PackLite 12 and the PackLite 16 could easily offset the need for a low-lumen flashlight in most emergency kits, glove compartments and center consoles. Just place it on your dash to charge every month or so and you’ll always have enough power to last through the night when you need it most. With so many possible uses in mind, these versatile lanterns are not just for natural disasters, vehicle emergencies and outdoor camping. Each are nice, but I think I prefer the PackLite 16 a little more. If you find yourself wanting to help people in need, don’t forget about LuminAID’s Give Light, Get Light program. 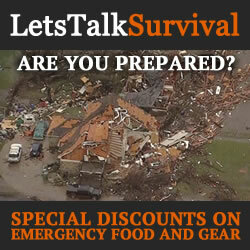 When we think of our most basic human needs, we often think of food, water and shelter. But when architecture graduate students Anna Stork and Andrea Sreshta were asked to design a product to assist post-earthquake relief efforts in Haiti, they considered the dangerous conditions at night in the tent cities and turned their attention to another critical need: light. 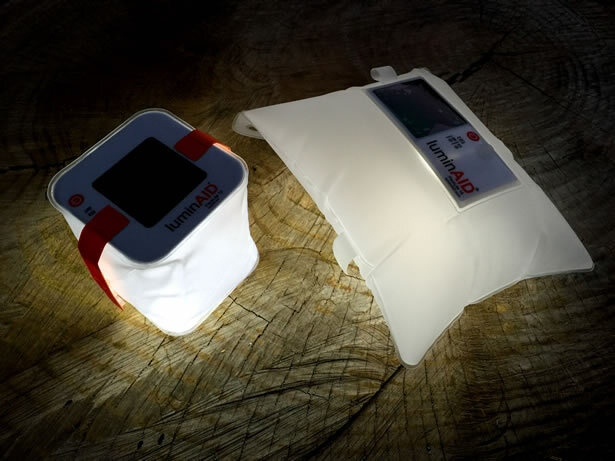 They designed the LuminAID light to be easily distributed in time of need by packing and shipping flat. 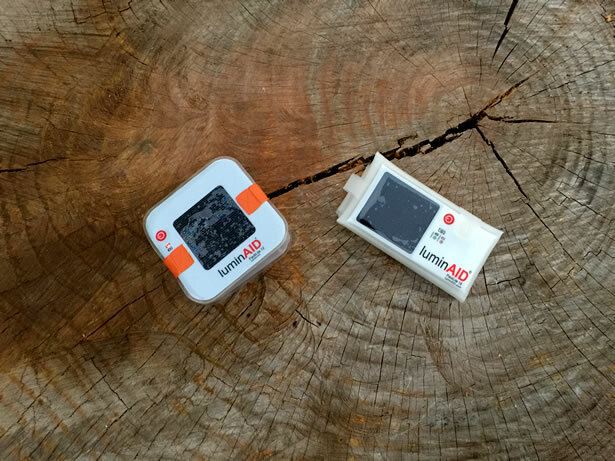 To date, through partnerships with NGO’s and relief organizations, LuminAID has assisted thousands of women and children by providing access to light in dangerous situations. Through the Give Light, Get Light program, people who purchase a special LuminAID light for themselves and simultaneously sponsor one to help make light more accessible and sustainable for all.